Connected gadgets are the hotness in tech right now. It seems like everyone is trying to track your activity during the day and your sweet sweet R.E.M.’s during the dark of night. Withings, makers of the Smart Scale and other connected tech., is now ready to join the world of fitness tracking with their new Pulse—a teensy little thing—which tracks your daily steps, pulse, sleep, and with its built-in sensors, even the altitudes you traverse. 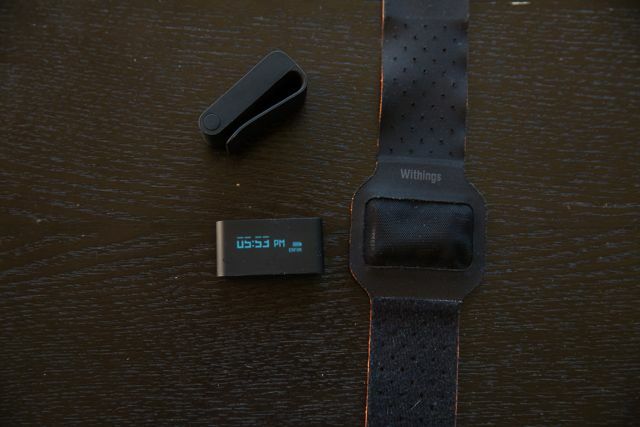 But there’s more to the story here than basic tracking; with historic data available on its touch-enabled screen and astute iOS integration via the Withings app, the Pulse is a talented first offering from Withings, and an easy fitness tracker to recommend. 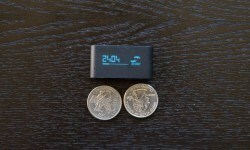 About the length of two quarters and light as a feather, Pulse was built to live in your pocket or clipped to your clothing where it’ll sit and count each and every step. 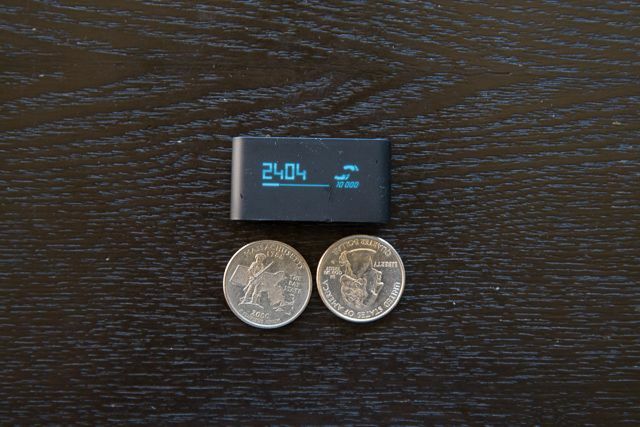 Based around the popular fitness philosophy of getting in 10,000 steps per day (about five miles), Pulse puts a meter counting down your 10k shuffle front and center, with both a step counter and progress bar. It seems a simple thing, but it did motivate me to increase my daily activity, and I liked being able to check its screen throughout the day to see where I stood. Pun intended. More than simple steps, though, Pulse also tracks the elevation changes in your walks, and shows you how many feet you’ve traversed in your day. I found that feature satisfying on long walks when I slugged it up big hills. Distance traversed and calories burned are also “calculated” by Pulse, though I use quotes because these figures are more of a guesstimate based upon your declared weight and Pulse’s estimate of your stride distance. 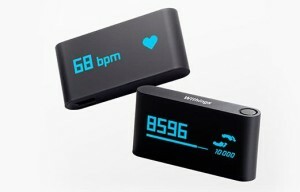 With its built-in sensor, Pulse can also measure your Pulse. Go figure! Touching your fingertip lightly to its backside accomplishes the task, and then this data is tracked in the Withings app just like the rest of your fitness stats. Moved from its little rubber case into an ultra soft wrist strap, Pulse can also track your sleep, and come morning, can report how long you were in bed, when you fell asleep, and how long you spent in light vs. deep sleep. 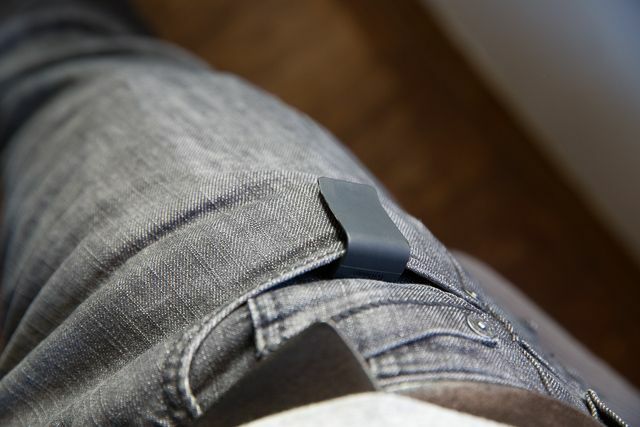 Stashed in a pocket, or clipped to my jeans in its clippy rubber case, Pulse is small enough that you won’t really notice it hitching a ride with you throughout the day. I also found its wrist strap easy to wear to at night. No, really. And I some take issue with having to move the Pulse from its day case to its night strap, but it didn’t bother me a bit. For those who don’t want the hassle, however, a Jawbone Up or Nike Fuelband might be more to your taste. Where my Pulse spends its days. Overall tracking worked great, and with its little touch sensitive screen, viewing current steps, calories burned, or other data, is pretty easy, though daytime viewing in bright light is will have you seeking shade. With its touch sensitive screen, Pulse makes viewing historic data easy too. A simple swipe of your finger navigates to data from previous days, though don’t expect the buttery smooth scrolling your iPhone provides; touch swiping on the Pulse is more of the lurch and surge variety—but hey—it works. Prepping Pulse for sleep mode is as as tapping a crescent moon icon, and when you wake up, turning day mode back on is just as easy. Viewing your daily stats is where fun starts. After connecting and syncing at what seems like random times, the Pulse hands off all its data to your iOS device, where you can view it laid out over time, and even graphed. 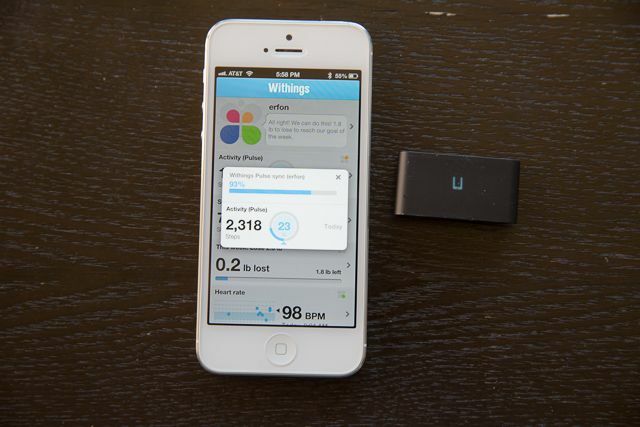 Withings’ smart app is where the tracking happens. Now, you can view your steps, pulse, and sleep data laid out over time, or for a more visual view, graphed. 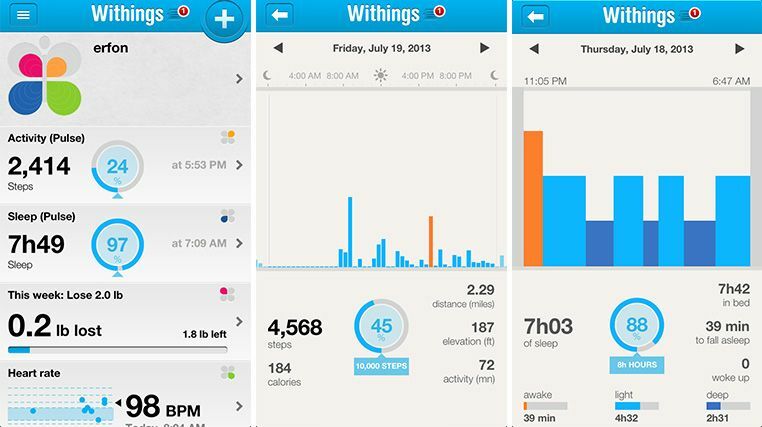 Withings’ app also shows you how intense different intervals of your activity were over the period of your day. This was helpful during walks and runs, plus conveys when you’re most active or glued to too long to a chair. The sleep information is also particularly interesting. It’s amazing to see how long you were in bed compared to how long you’re actually sleeping. And to be able to see how long I spent in different modes of sleep, e.g. light sleep versus the deep kind, was very intriguing, and I’ve now confirmed what I already knew: I need more zzz’s. Stalled syncs can be silent battery killers. 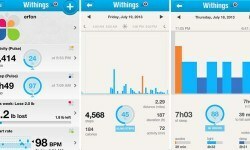 All of this information is tracked and aggregated into the Withings app, which also pulls in data from their other smart devices, to give you picture of your overall fitness. Paired with their Smart Scale and their blood pressure monitor, you could track an huge amount of personal fitness statistics. From there, you could give your doctor access to these stats if you wanted so he could see them too. The Pulse isn’t perfect, though; I experienced a bug that was quite agitating. When connecting to my iPhone (which it does via Bluetooth), the Pulse would sometimes not be able to make the connection, but it would keep trying until it ran its battery dead. I experienced this problem several times, and it would be frustrating because it meant you’d lose a big stretch of tracking, sometimes a whole day, because you’d suddenly find your battery dead. 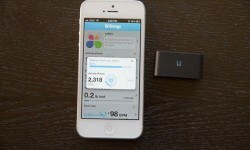 I’m hoping a firmware fix solves this problem; Withings seems to be cranking those out quite often, so fingers crossed. Pulse also isn’t very good at communicating when its battery is running low. I would sometimes find the unit dead when I went to use it; that never happens with my other devices. Pulse should make it glaringly obvious that its battery is running on empty. How else are we supposed to know when to recharge it? Syncing issues aside, I’d say expect 3-4 days of battery life from the Pulse. Mine seemed to hover around 3, but I was using it a lot. 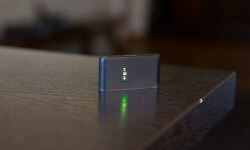 But when the Pulse does putter, it can be topped back up via your Mac very quickly, usually in 45 minutes. The Good: Built-in touch screen and good iOS integration. The Bad: Syncing issues can cause battery to die quickly. 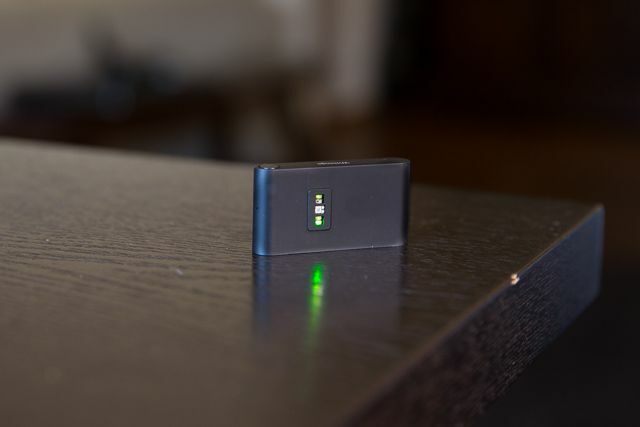 The Verdict A great fitness tracker that’s easy to recommend.